Avatar: The Last Airbender: "The Siege Of The North, Parts 1 and 2"
"The Siege Of The North, Parts 1 and 2" / "The Siege Of The North, Parts 1 and 2"
"The Siege Of The North, Parts 1 and 2"
The Siege of the North, Parts 1 and 2 (Book 1, Chapters 19 and 20; originally aired December 2, 2005). As in so many other stories, Book 1 all comes down to a giant holy fish monster and a girl who sacrifices her life to be the moon. It’s like a fairy tale. A weird, unsettling, unsanitized fairy tale. While last week’s episodes paused for a short breath, the two-parter this week is a breathless culmination of most of the plotlines from this season, constantly ratcheting up the tension until we get to the rampaging monster. We start with evidence of Katara’s swift improvement as a waterbender, while Aang seems oddly unengaged. Sokka and Yue continue to spend time together. Sokka takes her flying on Appa, and she is quite impressed, but their pseudo-date is interrupted by the reappearance of the black snow from the premiere. The Fire Nation is coming. Yue tells Sokka that they can’t spend time together. Ah, teenagers. Chief Arnook asks for volunteers for a dangerous secret mission, and poor lovesick Sokka is all over that action. Meanwhile, Zhao’s megalomania is at a peak. The first Fire Navy ship to arrive does considerable damage to Ice Venice’s outer wall. Aang hops aboard and destroys their catapults with an assist from Appa and a bunch of waterbenders on their tiny little Water Tribe canoes. Disabling that one boat, though, takes a lot of time and effort and as Aang looks out on the horizon, there are perhaps another hundred on the way. Secret mission HQ. Chief Arnook brings in an arrogant kid to show off some stolen Fire Navy uniforms. Sokka laughs because they are, as it turns out, some 85 years out of date. The Chief says that they need to figure out who is leading the Fire Nation attack. Sokka nonchalantly tells them all about Zhao. The arrogant kid is unimpressed, and asks the Chief (arrogantly, natch) how they know they can trust Sokka. The Chief tells the kid, Hahn, that he values Sokka’s insight and wants Hahn to listen to Sokka, adding that he expects no less from his future son-in-law. Sokka is floored that this arrogant jerk is the one who will marry his beloved Yue. Fireballs rain on the city. “Stop those fireballs,” yells Pakku, who has also apparently mastered the obvious. On the Fire Navy ships, Iroh recommends that Zhao stop the attack at twilight because the waterbenders draw their power from the moon. Zhao says he is working on a solution, but the Fire Navy casts anchor for the time being. Back in Ice Venice, Aang has stopped a dozen ships and barely scratched the surface of the armada. He is tired and disheartened. Somewhere in the armada, Zuko is preparing to kayak away. Iroh arrives for some final advice. It is a tender moments as he tells Zuko that he thinks of the boy as his own. Zuko tries to show honor to Iroh formally, but Iroh rushes him for a quick hug. Aw, man. Iroh is the best. As they literally grind axes, Hahn is bragging to Sokka (whom he calls So-ka) about how of all the girls he’s dated Yue has the best perks. “Perks?,” shouts Sokka, outraged. Hahn explains that while Yue is nice, what he’s most excited about is his proximity to the Chief. Sokka, ever the truthteller, says that Yue is wasted on a self-absorbed weasel like Hahn. Hahn is offended and condescends to Sokka that he’s a peasant from the South, no offense. Sokka tackles Hahn, but the Chief arrives and pulls him from the mission. Hahn leaves, promising to take out “Admiral Choi” in no time. “It’s Admiral Zhao,” shouts Sokka. Yue is explaining to Katara and Aang that the moon and ocean are the Water Tribe’s spirit and life. 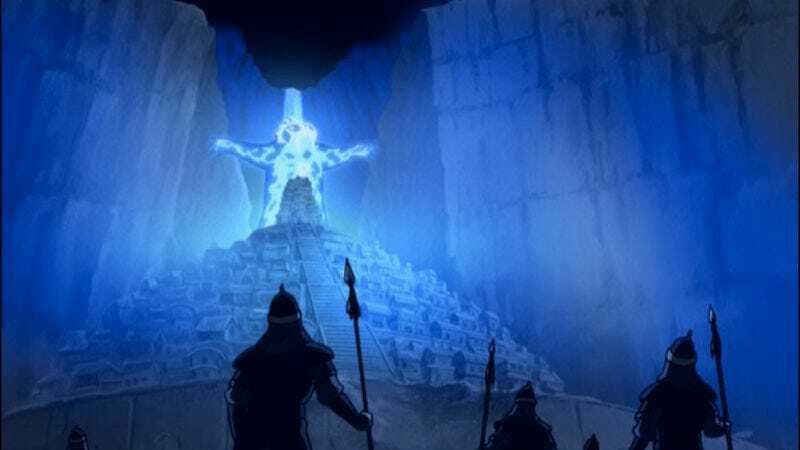 Aang has the idea to go into the spirit world and ask for their help. Yue thinks they may give him wisdom to win the battle. Aang is more excited about the prospect that they will an amazing spirit attack on the Fire Nation. The women are nonplussed. Or wisdom, says Aang, wisdom is good. Yue takes Aang and Katara to the most spiritual place at the entire North Pole, a grassy knoll with a little koi pond and garden. Meanwhile, Zuko follows the turtle seals (have I mentioned my theory that B’wana Beast is the true creator of this world?) through subsurface ice tunnels of freezing water. Kids, unless you can actually firebend and are incredibly lucky, don’t do what Prince Zuko does. Funny moment: Zuko commands the turtle seals to be quiet and they obey. The Fire Navy breaks through Ice Venice’s outer wall. Zhao is still a megalomaniac. Katara comes to, but Zuko and Aang are nowhere to be seen. We pan up to the frozen wasteland, where Zuko is dragging Aang’s body through a blizzard. End of part 1! Part 2 starts with a brief recap before we join Aang in the spirit world, currently occupying a mystic swamp. An annoyed monkey who is trying to meditate sends Aang off chasing fireflies. Aang sees Roku in his reflection. Roku tells him that the Ocean and Moon Spirits have been in the natural world since some time near the beginning. The only spirit old enough to know where they are is Koh, The Face-Stealer. Aang must not show any emotion when telking to Koh or Koh will steal his face. Hiding out in a cave, Zuko decides that it is time for a soliloquy. 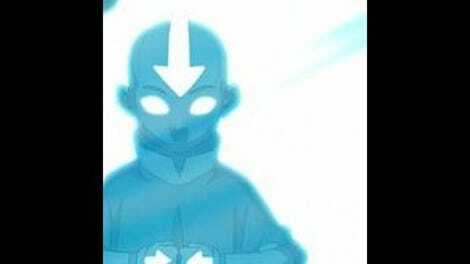 He compares Aang to his sister, saying that his father says she was born lucky, while Zuko was lucky to be born. See, among Fire Lord Ozai’s other skills, he is also a master bumper sticker coiner. Close in on Zuko’s face, which looks nastily frost-bitten. The Fire Nation attack seems to be going well. Iroh reminds Zhao of their time limit, as there is a full moon that night. Zhao says that he intends to remove the moon. Iroh is shocked. At that moment, Hahn arrives in his outdated duds. “Admiral Choi! Prepare to meet your fate!,” he shouts and rushes Zhao, who easily side-steps him, leaving the boy to plunge into the water far below. Hilariously, Iroh and Zhao don’t even comment on the attacker. Iroh just shakes his head sadly, and they pick up their conversation. Zhao explains that many years before, he stumbled onto a great secret library buried underground. One scroll told him where to find the Ocean and Moon Spirits. Zhao says it is his destiny to find them and kill them. Iroh says that spirits are not to be trifled with. Zhao says that he’s heard rumors about Iroh’s journey into the spirit world. Aforementioned Spirit World. Aang heads into a hole at the base of an enormous old tree with some trepidation. A faceless monkey reminds him to calm himself and show no emotion. The hole is a dark, dank place utterly unlike Totoro’s sunny idyllic tree hole. Koh, voiced by Eric Todd Dellums (who played Medical Examiner Frazier on The Wire and Luther Mahoney on Homicide), is an enormous centipede-snake thing who changes face with a weird blinking motion. He tells Aang that they’ve met before and that a previous Avatar tried to kill him. Aang is surprised, but he doesn’t show it on his face. The Aang Gang Featuring Yue is still working on their hit, “Looking For Aang In A Blizzard (Without Too Much Success).” Koh tells Aang that he’s already met the Moon and Ocean Spirits, Tui and La, push and pull, yin and yang. Aang shows surprise as he realizes that Koh is talking about the koi back in the Water Tribe’s sacred pond, but he regains his composure before Koh looks at him. Aang rushes out and tells Roku that he needs to return to the physical world. Roku sends Hei-Bai, our panda friend from The Winter Solstice, to lead him out. But they are too late. Zhao grabs the Moon Spirit and the night turns red. Waterbenders can’t bend. Yue is hurt, explaining that she was born sick and asleep and that her parents made a deal with the Moon Spirit for her life, which is why her hair is white. Zhao has another megalomaniacal speech about his place in history. Aang arrives and pleads with Zhao not to hurt the Moon Spirit. Iroh arrives and says that Aang is right, that the Fire Nation depends on the moon, too, and threatens great reprisals if Zhao hurts the Moon Spirit. Zhao’s face softens and he returns the fish to the pond, but his face suddenly twists in rage and he unleashes a fireball that kills the Moon Spirit. The moon disappears from the sky. Iroh attacks, but Zhao, seemingly stunned by his own actions, runs away. Aang goes into the Avatar State and communes with the Ocean Spirit. And then he becomes a giant holy fish monster and makes war on the Fire Navy. Meanwhile, Zuko confronts Zhao, who is surprised that the younger man is alive. Iroh realizes that Yue has some of the Moon Spirit’s life in her. She agrees and says that it’s her duty to give it back, over Sokka’s protests. She touches the fish and is instantly dead. Meanwhile, Holy Fish Avatar makes short work of the Fire Navy, while the waterbenders instinctively know to fall to their knees before the monstrosity. The Moon Spirit koi returns to life and Yue, now a manifestation of the spirit, flies up to the sky and becomes the moon. Seeing the moon back in the sky, the fish monster returns to the City, depositing Aang on a high wall along the way. Zhao and Zuko are fighting as the Ocean Spirit water reaches up out of a canal and grabs Zhao. Zuko makes to take Zhao’s hand and save him, but Zhao’s pride means that he pulls away and is drowned. The battle over, Pakku tells Katara that he and some of the other benders are heading to the South Pole to rebuild. Pakku tells Katara that she is now Aang’s waterbending master. Chief Arnook and Sokka talk about Yue’s sacrifice. “You must be proud,” says Sokka, sadly. “So proud,” says the Chief, adding “and sad.” After a brief interlude where Iroh and Zuko escape, the Aang Gang gathers to look nobly out at the horizon. We cut to Fire Lord Ozai, who is telling Zuko’s sister that Iroh is a traitor and Zuko is a failure. He has a task for her. What will it be? I’ll bet we find out in the next season! I realize that this is long on recap and short on review. These two episodes had a lot of ground to cover, so I haven’t spent much time analyzing their merits here. I hope it’s clear that I adore the giant holy fish monster. Yue’s sacrifice would probably mean more to me if we had spent more time with her, but I do appreciate the execution of her storyline. I also like that they gave her father, who was mostly a nonentity, a moment to express his grief. These episodes pound Zhao’s megalomania into our heads, but I thought that he was portrayed realistically for a megalomaniac. All the ones I've known, at least. Zuko’s final admission to Iroh that he was too tired to chase the Avatar was a nice moment to remind us that he is changing, and I agree with the commenters who say that this is Zuko’s story as much as it is Aang’s. There’s also been some discussion about whether Aang has killed anybody. It seems clear as day to me that Aang killed Fire Nation soldiers in the battle, althoug perhaps without intent. I’m no scientist or doctor, but I’m pretty sure that if you dump a man into freezing water, they will need to be rescued fairly quickly or they will die. While in the Avatar State, he certainly appeared to dump a lot of soldiers into water, and they didn’t show anyone coming up for air. But I do think that intent is important for his spiritual state, and I doubt that he meant to kill anybody, for what it's worth. He's certainly not responsible for Zhao's death. That’s all I have for today, so I’ll see you next week for the first two episodes of season two!